On 13 November 1984, a Soviet missile was launched from Kapustin Yar, east of Stalingrad. About forty minutes later an R-36M intercontinental ballistic missile blasted off from an underground silo in Kazakhstan. Known to Western intelligence experts as the SS-18 Satan missile, it was capable of carrying either a single 24-megaton warhead or eight independently targeted 600-kiloton warheads. The bomb that killed some 200,000 people at Hiroshima was just 12 kilotons. The launch was monitored by the West’s spy satellites. But it was an unexceptional moment in the history of the arms race and soon forgotten. Only after the Berlin Wall had been breached, and the ice of the cold war began to thaw, did military analysts realize the significance of these otherwise unexceptional rocket launches. They were the first operational test of what the Western press later described as ‘Russia’s doomsday machine’. 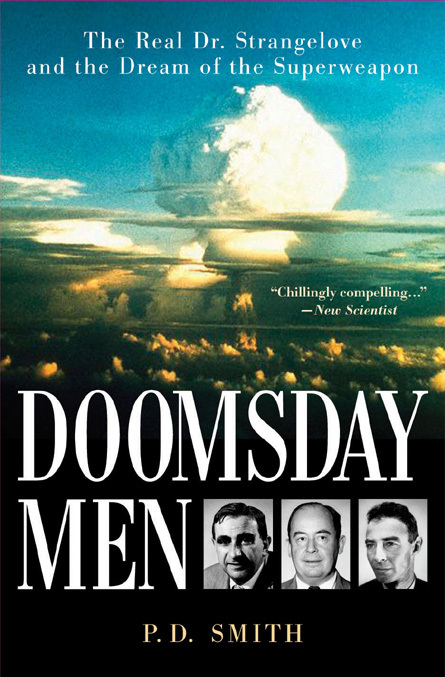 In my book Doomsday Men, I showed how popular culture played a vital role in inspiring the dream of the superweapon, a dream that in the nuclear age turned into the nightmare of mutually assured destruction, or MAD. More than any other weapon, it was Leo Szilard’s chilling notion of the cobalt bomb (first described on American radio in 1950) that came to symbolize the threat of global nuclear destruction. 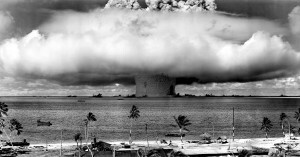 The C-bomb consisted of one or more massive hydrogen bombs jacketed with cobalt. It was the ultimate weapon, a doomsday device which could spread radioactive fallout across the entire planet. 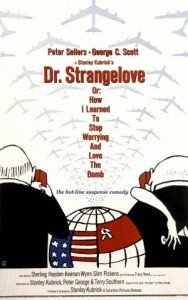 As throughout the history of superweapons, fiction and film played a key role in exploring the horrific implications of the C-bomb and how it could be used to create a doomsday machine, most famously in Peter George’s best-selling thriller Red Alert (1958) and Stanley Kubrick’s cold-war classic (based on George’s novel) Dr Strangelove or: How I Learned to Stop Worrying and Love the Bomb (1964). Twenty years after Kubrick’s film depicted the world being destroyed by a Soviet doomsday machine, the real one became operational. Nicknamed by its commanders ‘The Dead Hand’, it was a sophisticated system of sensors, communication networks and command bunkers, reinforced to withstand nuclear strikes. At its heart was a computer. As soon as the Soviet leadership detected possible incoming missiles, it activated the system, known by its code name ‘Perimetr’. Part of the secret codes needed to launch a Soviet nuclear strike were released and the computerized process set in motion. Then, like a spider at the centre of its web, the computer would watch and wait for evidence of an attack. Much about the Dead Hand system is still shrouded in secrecy. Russian arms expert Bruce Blair revealed the first details in 1993. Recently declassified interviews with former Soviet officials have cast fresh light on the system. They show that there were doubts about its reliability. Some even questioned whether it was ever fully deployed. However, these interviews also reveal the shocking possibility that the Dead Hand system may have been fully automatic. Previously it was thought that once the computer detected signs of an attack, it required human approval before any counter attack could be launched. A Soviet officer buried deep underground in a command post would have had the unenviable task of authorising the Dead Hand to complete its lethal task. But these interviews raise the possibility that the Dead Hand had eliminated the need for any human control. It may be that the Dead Hand could launch the entire Soviet nuclear arsenal as soon as its sensors indicated that an attack had occurred. That idea is truly terrifying. A machine would be responsible for unleashing nuclear weapons with a total destructive power as much as 50,000 times greater than the bomb that destroyed Hiroshima. Even without Szilard's C-bomb, who knows what would be left alive after such a nuclear holocaust. Intriguingly, Nicholas Thompson, writing in Wired today, argues that Perimetr was actually designed ‘to keep an overeager Soviet military or civilian leader from launching prematurely during a crisis’. In other words, it was an insurance policy meant to reassure the Kremlin’s hawks that their country could hit back, even after a sneak attack by submarine launched missiles, which would have given the Soviet leadership barely thirteen minutes advance warning of a devastating attack. The doomsday machine is supposed to be the ultimate deterrent. But if no one knows that the deterrent exists... Well, you've all seen the final scenes of Dr Strangelove. militaristic. The world is far stranger, and the future will be far odder, than anything imagined in a war studies seminar based on the predictions of climate modellers. We know less than we think. But as an insight into what the military strategists imagine is going to happen as a result of climate change, this book is truly terrifying."